Since 1978, urban redevelopment in China has resulted in large-scale neighbourhood demolition and forced residential relocation, which can severely disrupt established people-place interactions in the demolished neighbourhoods. Urban redevelopment in China has also been criticized by the public and scholars, because the position of the residents in decision-making processes of urban redevelopment is often marginalized. Conflicts have arisen between the residents, local governments and developers, against the backdrop of the uneven redistribution of capital accumulated via urban space reproduction such as the replacement of declining neighbourhoods in which low-income residents reside, with newly-build high-rise dwellings for middle- or high-income residents (Qian and He 2012, Weinstein and Ren 2009). The aim of the thesis is to gain a deeper understanding of the influence of urban redevelopment and its induced forced relocation on residents, by investigating their behavioural and emotional responses to the state-led urban redevelopment in Shenyang, a Chinese city. In particular, it highlights the agency of the affected residents, through exploring their interactions with other stakeholders and through displaying the ambivalence embedded in their neighbourhood experiences. The research firstly conceptualises forced relocation as a process and as a specific type of residential mobility that occurs in the context of urban restructuring. It suggests a conceptual model to show the sequence of events that households experience during urban redevelopment, by dividing forced relocation into three stages: the pre-demolition stage, the transitional stage and the post-relocation stage (chapter 2). This conceptual model helps to reduce the distraction caused by the accumulation of the dynamics of relocatees’ experience as the urban redevelopment proceeds over time, by capturing the sequence of the events that occur to relocatees during urban redevelopment. We used the model to structure the analysis of the literature review and subsequently identify the gaps in the literature that should be addressed in future forced relocation studies about China. We discovered that the experiences of relocatees from household and residential mobility perspectives reveal the dynamic, variable and complex nature of forced relocation, which makes forced relocation in urban China not necessarily equivalent to displacement. We particularly targeted at the residents who are undergoing the pre-demolition stage of state-led national scale Shantytown Redevelopment Projects (SRPs) in Shenyang, a city in Northeast China. Since 2008, the central government has initiated SRPs to improve the living conditions of low-income residents living in declining neighbourhoods. Between 2008 and 2012, about 12.6 million households in China were involved in SRPs, and forced to move as their dwellings were demolished. These residents are stayed homeowners living in declining danwei communities and urban villages. They are among one of the most deprived social groups due to unemployment, low-income, serious illness etc., and cannot afford better dwellings. We found that (prospective) relocatees’ experiences at this stage are worthwhile to study. Their experiences and compensation choices at this stage can affect their follow-up housing experiences, since they need to make significant decisions with regard to the type and the amount of compensation (in-kind or monetary) that they can get from local governments and/or developers. However, current studies mainly target the relocatees who are already at the post-relocation stage to recall their pre-relocation experiences to evaluate the outcomes of forced relocation, which might lead to distorted retrospective accounts of their experiences and causes of their behavioural and emotional responses to the forced relocation (Goetz, 2013; Higgins and Stangor, 1998). This pre-relocation stage is also the most stressful and conflicting stage for the relocatees involved in urban redevelopment and forced relocation. It is the stage that includes land expropriation, compensation negotiations and forced movement, after intensive interactions between residents and other stakeholders. In chapter 3, we discuss a complex interplay between different stakeholders, by focusing the implementation of SRPs and the changing roles of different stakeholders. Conflicts arise between different stakeholders, featured by frictions between the central and local governments regarding the implementation of SRPs, the mismatch occurs between the scope of the SRP policy and residents’ attempts to improve their socioeconomic situation, and an entrepreneurial paradox in the relationship between local governments and developers. However, we also discovered that various stakeholders have consensus on the need for improving the living conditions in deprived neighbourhoods and on boosting the housing market. In particular, by displaying the consensus between residents, local governments and developers, we reveal the agency of residents during urban redevelopment (see also Manzo et al., 2008; Posthumus and Kleinhans, 2014). To a certain extent, residents are willing to accept urban redevelopment and forced relocation to improve their living conditions. They also intend to maximize their benefits from the redevelopment, by mobilising strategies such as constructing illegal buildings to improve the overall value of their dwelling, or by making appeals to local governments to intervene in the redevelopment (chapter 4). In addition, this research investigates the interaction between people (residents) and place (neighbourhoods) from the perspective of place attachment and ageing in place, to show the influences of urban redevelopment and forced relocation on the residents. By revealing the lived experiences of homeowners and older people in danwei communities and urban villages, we found that residents have ambivalent attitudes towards forced relocation and urban redevelopment. On the one hand, these residents anticipate a potential improvement of their living conditions via SRPs, because neighbourhood decline has been challenging their daily activities and decreasing their quality of life for years. From a people-place interaction point of view, this might be contradicting earlier research which emphasizes the more ‘romantic’ side of people-place interactions, such as place attachment and its related components (e.g. neighbourhood-based social networks and mutual help), that contribute to relocatees’ willingness to stay in their neighbourhoods when facing neighbourhood redevelopment and demolition (Fried, 1963; Manzo et al., 2008). On the other hand, many homeowners and older people are unwilling to move, since their current neighbourhood makes them feel rooted and enables them to develop living strategies to relieve their deprived socio-economic situation. Therefore, we suggest that when studying the influence of urban redevelopment on relocatees, the wider impacts of place attachment on their moving behaviour should be revealed by carefully examining their positive and negative lived experiences and the roles of different dimensions of place attachment (Livingston et al., 2010; Oakley et al., 2008; Vale, 1997). Based on the aforementioned findings, several directions for the future research can be proposed. Firstly, more research on temporal changes of individual perceptions and experiences during and after urban redevelopment is needed. In particular, we propose to conduct a longitudinal panel survey following relocatees from the three stages to identify how and why forced relocation and urban redevelopment affect the well-being of the relocatees over time and how the outcomes of relocation vary over time. Second, the heterogeneity of the affected residents and the interrelationship of this heterogeneity with their experiences should also be addressed more specifically in future research. Finally, in addition to the declining urban neighbourhoods such as danwei communities, inner city old neighbourhoods and urban villages, other types of neighbourhoods involved in Shantytown Redevelopment Projects (SRPs) should be a focus of research, for example remote rural communities established by state-owned enterprises and enterprises specialised in mining, agricultural and forestry production. We suggest that more comparative studies should be conducted with regard to governance of SRPs and its influence on the relocatees from different regions and cities across China. Our research findings can be useful for the central state and local governments to recognize the problems existing in SRPs, such as the disparity between the project scope and the expectations of the residents, the ignorance of the diverse needs of the affected residents, and the uncertainties and related negative influence on the residents in relation to the project implementation. We suggest local governments to consider the physical, social, economic and psychological influences of urban redevelopment on residents. In particular, the research suggests local governments to carefully design the compensation policy, which concerns the relocatees the most. The compensation criteria should cover various needs of relocatees regarding rehousing, such as dwelling size, nearby public and commercial facilities, and job opportunities. Local governments need to better investigate the socio-economic and family situations of affected residents before the redevelopment and forced relocation, since the needs and the expectations of different relocatees about redevelopment differ as well. Urban China has witnessed rapid urban (re)development since the 1980s, which is featured by the forced relocation of millions of residents and large-scale demolition of old neighbourhoods, such as the old inner city neighbourhoods, danwei communities or urban villages (He et al., 2010; Liu and Wu, 2006). Compared to urban redevelopment programmes in the USA and Western Europe, the scale and numbers of affected residents and neighbourhoods demolished in China is substantial. For instance, between 2008 and 2012, about 12.6 million households were involved in the national Shantytown Redevelopment Projects (SRPs) (MOHURD, 2013), which aim to improve the living conditions of low-income residents and to stimulate the depressed housing market. Their dwellings were demolished by local governments and they were forced to move to relocation neighbourhoods established by local governments, or to purchase dwellings elsewhere within the city, assisted by monetary compensation from local governments. There is still more to come. In 2013, the central state has triggered the second round of large-scale SRPs. It was estimated that approximately 10 million households will be affected by this second round (Li et al., 2017a; The State Council of PRC, 2013). Such extensive residential redevelopment projects have resulted in tremendous social, economic and physical changes in urban areas, parallel to the emergence of massive numbers of relocatees. Compared with the sheer numbers of affected residents in China, the research on the experiences and perceptions of residents involved in forced relocation and urban redevelopment is still limited. Previous research in China often takes urban redevelopment and forced relocation as a single event and mostly targets the postrelocation situation (Day and Cervero, 2010; Fang, 2006; Gilroy, 2012; He and Liu, 2013; Hu et al., 2015). In addition, some studies and news reports have shown the conflicts and tensions between relocatees and local governments or developers from a macro-, meso- or political-economic perspective (He, 2012; Hin and Xin, 2011; Qian and He, 2012; Sichuan News, 2009; Weinstein and Ren, 2009), which gives an impression that the role of residents in redevelopment projects is always passive. On the one hand, this might reflect wider experiences, since residents in declining neighbourhoods often have limited resources and rights to influence the redevelopment process in order to maximise their own benefits (He, 2012; Shin, 2016). On the other hand, however, this impression can lead to the ignorance of the active role that relocatees may play before and during the process of urban redevelopment and forced relocation; an active role which may be revealed by their behaviours and perceptions regarding their original neighbourhoods, the neighbourhood redevelopment and forced relocation as well as their choices during this process (Ho, 2013; Shi and Zhu, 2013). In particular, different residents with different perceptions and neighbourhood experiences can have different coping strategies, which means that a seemingly similar intervention (urban redevelopment and forced relocation) is likely to be experienced in various ways by different residents (Kleinhans, 2003; Kleinhans and Van der Laan Bouma-Doff 2008; Posthumus and Kleinhans, 2014). For instance, various forms of neighbourhood decline, such as crime, social disorder or physical environmental deterioration, often have a negative influence on residents’ perceived quality of life, which can trigger some residents to move out as shown for the United States, United Kingdom and the Netherlands (Feijten and van Ham, 2009; Livingston et al., 2010; Vale,1997). Forced relocation might be an opportunity for improvement for those who want to move in the context of redevelopment, by using the relative advantages offered by relocation compensation schemes (Kleinhans and Van der Laan Bouma-Doff, 2008). However, other residents, especially those who are deprived (e.g. with low-incomes, unemployed or age-related diseases), might feel disrupted if they are highly dependent on their neighbourhoods in various ways (e.g. closeness to job opportunities, cheap rent, and social networks) (Day and Cervero, 2010; Fried, 1963). In addition, some residents may feel increasingly ambivalent facing forced relocation as they may have both positive and negative experiences in their neighbourhoods which might make it difficult to evaluate the negative and positive influences of urban redevelopment and forced relocation before they actually relocate. Similarly, in China, the effects of forced relocation on relocatees during and after urban redevelopment projects are diverse and not necessarily negative. While several scholars have blamed large-scale property-led restructuring projects in China for causing displacement of low-income residents (Gong, 2012; He, 2012; He and Wu, 2007; La Grange and Pretorius, 2016;), other studies have demonstrated real improvements in relocatees’ (perceived) living conditions after relocation (Li and Song, 2009, Wu, 2004a, 2004b; Xia and Zhu, 2013). Driven by the above concerns, this thesis provides a systematic overview and indepth research of the influence of urban redevelopment and forced relocation on affected residents, by focusing on their pre-relocation perceptions and behaviours and by investigating their neighbourhood experiences with regard to social, economic, physical and psychological aspects. The research takes the state-led urban redevelopment projects in Shenyang as a case study to provide a comprehensive understanding of residents’ experiences in the Chinese context. Shenyang is considered as a pioneer of SRPs in China, and the Ministry of Housing and Urban- Rural Development of PRC (MOHURD) has promoted the ‘Shenyang Mode’ of urban redevelopment nationally due to its success on SRPs (Shenyang Daily, 2016). In particular, the thesis focuses on the complex and dynamic nature of homeowners’ lived experiences in declining neighbourhoods that will be target areas of SRPs. Contrary to the majority of existing research, this thesis investigates the pre-demolition stage, i.e., the stage when residents have not yet moved out of their neighbourhoods, but have been informed that their neighbourhoods are going to be demolished due to SRPs. Therefore, the main aim of the thesis is to gain a deeper understanding of how forced relocation and urban redevelopment affect residents of declining neighbourhoods in Shenyang, in terms of their pre-relocation neighbourhood perceptions and behaviours. Section 1.2 provides a theoretical background with regard to residents’ overall experiences with urban redevelopment and forced relocation in the Chinese context. In section 1.3, the research questions are presented. Section 1.4 describes the research area – Shenyang, a city in Northeast China. Section 1.5 discusses the data and methods used in the thesis. The last section presents the outline of this thesis. Despite the massive forced relocation of residents during urban restructuring in China, there is no systematic overview regarding how residents experience the process and its outcomes. Most studies concerning urban restructuring in China directly equate forced relocation with displacement, which has a negative connotation. This exclusively negative view overlooks the multifaceted effects of forced relocation on relocatees. This paper aims to provide a better understanding of relocatees’ experienced during urban redevelopment in China by establishing a conceptual model in which the time sequence of events and their context are central, and by analysing the existing research on this topic about China. It conceptualises forced relocation as a process with various and changing socio-spatial implications over time, and as a specific type of residential mobility that occurs in the context of urban restructuring. As such, the paper presents a conceptual model that includes different stages and contexts to analyse the experiences of relocatees during and after forced relocation. It divides the process of forced relocation into a pre-demolition stage, a transitional stage and a post-relocation stage and investigates the social, economic, physical, psychological and behavioural dimensions of the experiences of relocatees as affected by the macro and micro context. As such, the conceptual model is used to structure the analysis of the existing literature about residents’ experiences and subsequently identify the gaps in the literature that should be addressed in future studies of forced relocation in the Chinese context. Since 1978, market transition in China has significantly influenced the roles of the state, the market and the residents in urban restructuring. Since 2008, the central government has initiated Shantytown Redevelopment Projects (SRPs) to improve the living conditions of low-income residents. Between 2008 and 2012, about 12.6 million households were involved in SRPs, and forced to move as their dwellings were demolished. This paper investigates how SRPs are implemented by revealing how different stakeholders interact in SRPs in the city of Shenyang, China. Through indepth interviews with various stakeholders and analysis of policy documentation on SRPs, the paper reveals a complex interplay between different stakeholders, which is characterized by the centralization of the inception of SRPs, the decentralization of actual SRP implementation, changes in the role of market forces, and decreasing housing affordability and multiple deprivation of residents in SRP target areas. Various stakeholders have consensus on the need for improving the living conditions in deprived neighbourhoods and on boosting the housing market. However, conflicts arise due to frictions between the central and local governments regarding the implementation of SRPs. We also find evidence of an entrepreneurial paradox in the relationship between local governments and developers. Finally, a mismatch occurs between the scope of the SRP policy and residents’ attempts to improve their socioeconomic situation. Facilitating ageing in place enables older people to remain in familiar places, namely their homes and neighbourhoods, as long as possible. However, urban redevelopment that includes the forced relocation of residents often makes ageing in place impossible. The present research examined how impending neighbourhood demolition affects the ageing in place of older people in Shenyang, China. Starting with the presscompetence model and related academic work concerning the influences of person– environment interaction on the wellbeing of older people, this paper discusses the impact of forced relocation and demolition on the meaning of home, the living arrangement and the role of family, and strategies to maintain the independence of older people. Transcript analysis of 54 semi-structured interviews with older residents revealed their ambivalent feelings towards the impending demolition. Long-term residence in declining neighbourhoods makes them feel rooted and enables them to develop their living strategies and plan for ageing in place. However, neighbourhood decline challenges their daily activities and they increasingly struggle to maintain their independence, which leads them to consider impending neighbourhood redevelopment as an opportunity to improve their living conditions. The impending forced relocation interrupts their place-based identity and living strategies and causes significant stress due to their lack of autonomy in the decision making on the relocation process, the move itself and their uncertainty regarding their post-relocation life. Implications for further research and policy are provided. Large-scale urban redevelopment in China has been taking place for decades since the market transitions from 1978, which have caused massive forced relocation of residents (He and Wu, 2007; MOHURD, 2013). This thesis has provided a comprehensive study on relocatees’ perceptions and experiences at the pre-demolition phase of the forced relocation and state-led urban redevelopment. 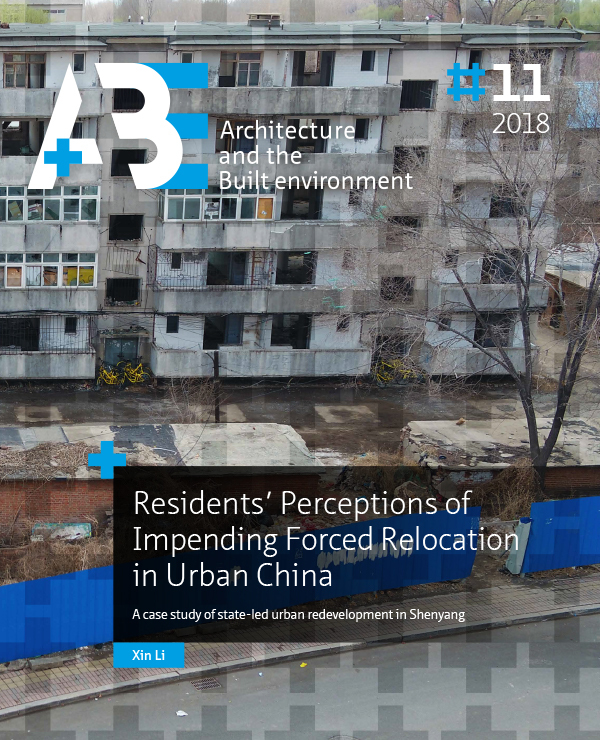 Through an extensive overview of existing literature on the experiences of the affected residents and in-depth interviews with residents and other stakeholders in urban redevelopment, the thesis shows that current studies have largely ignored the temporal feature and dynamics embedded in urban redevelopment and forced relocation in the Chinese context. Also, the ambivalence of relocatees’ perceptions towards their lived experiences in their neighbourhoods is not fully addressed. Many studies and news reports have merely displayed the conflicting interactions between the residents and project initiators such as local governments or developers, and have considered the redevelopment projects as if they were a static event (He, 2012; Hin and Xin, 2011; Sichuan News, 2009). This conceals the mechanisms and complexity underlying the controversial and conflicting nature of forced relocation in the context of urban redevelopment. Driven by these concerns, we especially focus on individual relocatees’ perceptions, experiences, and behaviours towards impending forced relocation and urban redevelopment. We highlight the ambivalence in the interactions between residents and neighbourhoods (people-place) as well as residents, local governments and developers, from a residential mobility perspective. Our research therefore aims to gain a deeper understanding of how forced relocation and urban redevelopment affect residents of declining neighbourhoods in Shenyang, in terms of their pre-relocation neighbourhood perceptions and behaviours. This thesis is organized as followed. Chapter 1 is the introduction, which focuses on the research background, research aim and questions, research data and methods, and the history of urban (re)development of Shenyang. Chapter 2 provides a literature review on the experiences of residents, particularly the homeowners, during forced relocation in the Chinese context. This chapter is also the theoretical basis for the thesis, by identifying gaps in existing research and outlining the research questions for the following chapters. Chapter 3, 4 and 5 focus on the influence of Shantytown Redevelopment Programmes (SRPs) on the various dimensions of the perceptions and experiences of residents from declining neighbourhoods that are involved in the SRPs in the city of Shenyang. Chapter 3 investigates the evolution of the SRPs, related policies and the changing roles and interactions between the different stakeholders involved in SRPs, against changing macro-, social, economic and institutional contexts. Chapter 4 and 5 put the spotlight on individual residents’ experiences by specifically focusing on the people-place interactions with regard to place attachment and the ageing in place of older people. These two chapters also reveal the influence of the impending SRPs and impending forced relocation on the people-place interaction. The following section firstly summarizes the key findings of each chapter. A reflection on the research is presented in section 6.3. The last section outlines future directions for research and the policy implications.